Last Sunday after a morning swim we had lunch on the beach in Kalives. My friend said, let's go for a walk! So at 3pm we drove to the Imbros Gorge, a very easy walk with a shaded, gentle decline suitable for everyone. At the end of the 2 hour walk we were driven in the back of a pick up truck to the starting point to collect our car. Continuing down to Chora Sfakia driving through the dramatic mountainous landscape we reached the bustling little port to catch a water taxi for a 15 minute ride to my favourite place on the island, Loutro. This tiny bay has no cars, just some tavernas, accommodation and the clearest sea. Pure escapism. 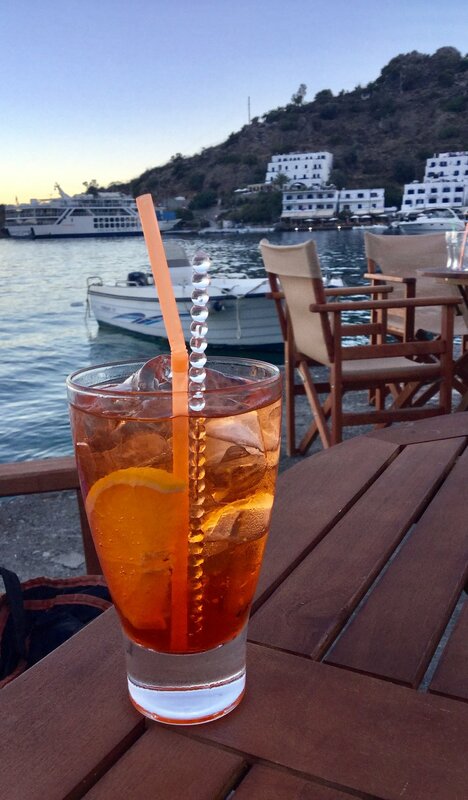 We arrived at 6pm in time for an aperol spritz to watch the sun go down. After a delicious fish feast in one of the waterfront tavernas we caught the 10pm water taxi back, the ride even more spectacular under a blanket of stars and a warm south wind. On the way home we stopped for cakes at the best bakery in the area before home! And that's how we do a Sunday afternoon excursion!